jQuery plugin to create toggled off-canvas multi-level navigation mega menu that offers unlimited nesting of sub-menu elements. HC Off-Canvas Nav is a CSS and jQuery based mega menu plugin that helps you to create an awesome, mutli features, cross browser and cross platform menu navigation for your website/app. 1. To getting started with HC Off-Canvas Nav load the required libraries (jQuery, and Knockout JS) and also Google Material Design Icons in your HTML document. 3. 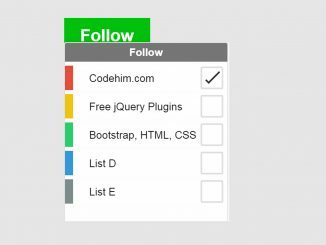 Create basic HTML structure for main menu navigation. 4. Active the plugin by calling it in jQuery document ready function. 6. The menu position where from menu will open. Available options for position are: ‘left’, ‘right’, ‘top’ and ‘bottom’. 7. Submenu levels open effect. Available options are: ‘overlap’, ‘expand’, ‘none’ or false. navTitle: "jQuery Mega Menu Plugin"
11. Disable the window scroll when off-canvas opened. Set false to enable scrolling. Default: true, type: bool. The following are some other useful options to customize the working of this mega menu plugin. customToggle: null, //element object	Custom navigation toggle element. insertClose:	true, // Insert navigation close button. You can also use an integer representing 0-based index that will be the position of the button in the list. Negative numbers are also supported. insertBack: true, //Insert back buttons to submenus. You can also use an integer representing 0-based index that will be the position of the button in the list. Negative numbers are also supported. labelClose:	'Close', //Label for the close button. labelBack:	'Back', //Label for the back buttons.